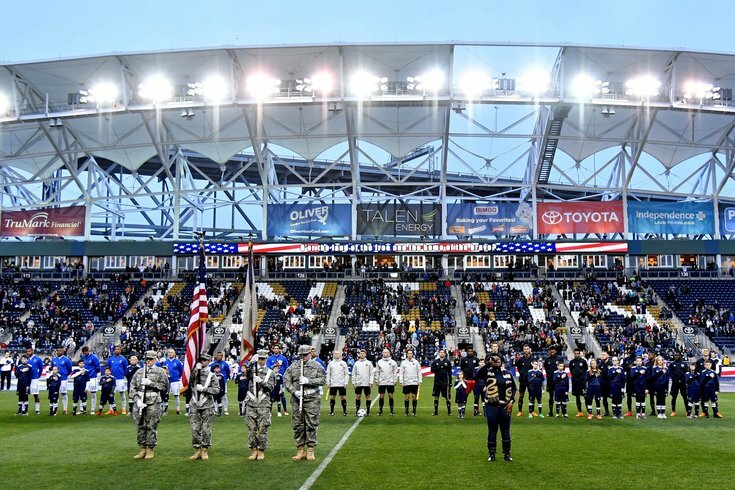 The San Jose Earthquakes and Philadelphia Union during national anthem at Talen Energy Stadium. Philadelphia's Major League Soccer club, the Union, don't actually play in Philadelphia; the team's home field, Talen Energy Stadium, is in Chester, about a 30-minute drive from Center City Philly. To help those in Philly who don't want to drive or take public transit, the club is offering a new bus program that will take fans to and from the games, picking them up at select city bars. Additionally, XFINITY Live! will offer drink and food specials to those wearing Union gear before games. Round-trip tickets will cost $15. Fans will also have the option to buy a combo ticket that includes the $15 bus fare and a separately-priced ticket to the game. All buses will leave downtown Philly 2 hours before the start of the game. Fans will be dropped off at stadium lot D, and buses will leave from a designated area 20 minutes after the final whistle. The first "U-Ride" will be available before the game against D.C. United. on Saturday, April 28. More information can be found here.